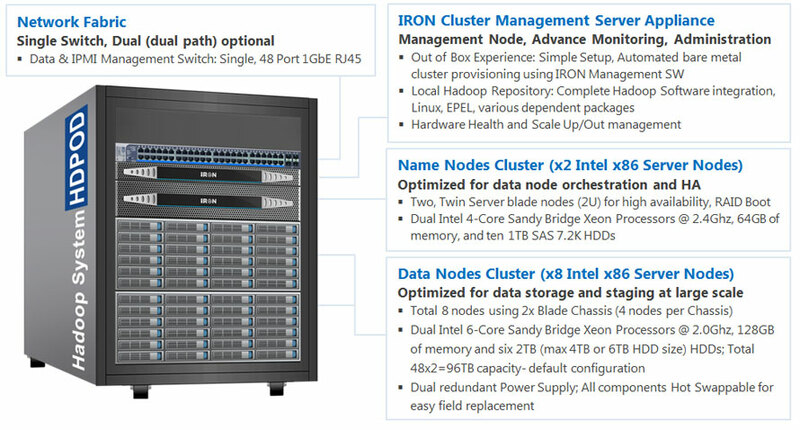 Iron Networks Big Data Appliance HDPOD is a comprehensive Hadoop Big Data platform, engineered for reliable data processing with a low overall total cost of ownership. The HDPOD combines network, server and storage hardware, and the comprehensive Hortonworks Data Platform (HDP) software suite into an optimized turnkey configuration. This creates a complete single SKU solution with integrated hardware, software and support services that is simple to acquire and deploy. The HDPOD Appliance for Hadoop with Hortonworks Data Platform is built using industry-standard commodity hardware and offers low cost, fast performance with the latest generation of Intel technology combined with a fabric-based hardware configuration for enterprise-class data storage and management. The HDPOD appliance platform helps enterprises derive value almost instantly with low project risk and cost by providing a single platform for multi-workload data processing across an array of processing methods, from batch through interactive to real-time - all supported with solutions for governance, integration, security and operations. Apache Hadoop is a core component of the modern data architecture, integrating with and complementing your existing systems to create a highly efficient, highly scalable way to manage all your enterprise data. HDP's modern data architecture provides the foundation for your own enterprise Data Lake, which is an integral part of your business strategy for unleashing analytic insights and innovations that help you compete and win in today’s marketplace. HDPOD platforms provides analysts the ability to leverage valuable customer insights (across all channels; web, mobile, social media, email, contact center, database, and storefront, and other type of customer interaction data) in their analysis while using familiar tools. Information Infrastructure Optimization, for faster and flexible application delivery and better business results. Information Management Standardization, eliminate islands of incompatible infrastructures. Information Insight Acceleration, faster intelligent business decisions. Accelerate the journey to big data using simple, efficient, flexible and open architecture Iron Networks offers enterprise and service provider system designs that are reliable and energy-efficient, coupled with simplified serviceability and deployment services. Our solutions with power efficient design, high density configurations and leading-edge management software help organizations manage the modern data center and benefit from cloud and big data computing-faster and easier. Hadoop Standardized Architecture: A 100 percent open source Apache Hadoop-based software stack designed to store, process and analyze data in any format at any scale. Deep Integration: Purpose-built, low cost big data appliance that integrates hundreds of software packages including database, server, storage and big data technologies into a single, easy to manage, industry standard x86 system without vendor lock-ins. Simplicity: Automated management and provisioning, shorter POC deployment cycles and faster time to value for analytic initiatives, allows your experts to focus on innovation. Highly Scalable: Massively parallel analytic system allows customers to crunch through multi-terabyte data volumes. Hadoop deployments require customers to acquire hardware to specific configurations, racking and configuring the hardware, operating system deployments and configurations, and installation of a huge set of Hadoop software packages with hundreds of pre-requisite packages. These deployments typically require several weeks to months of development cycle. 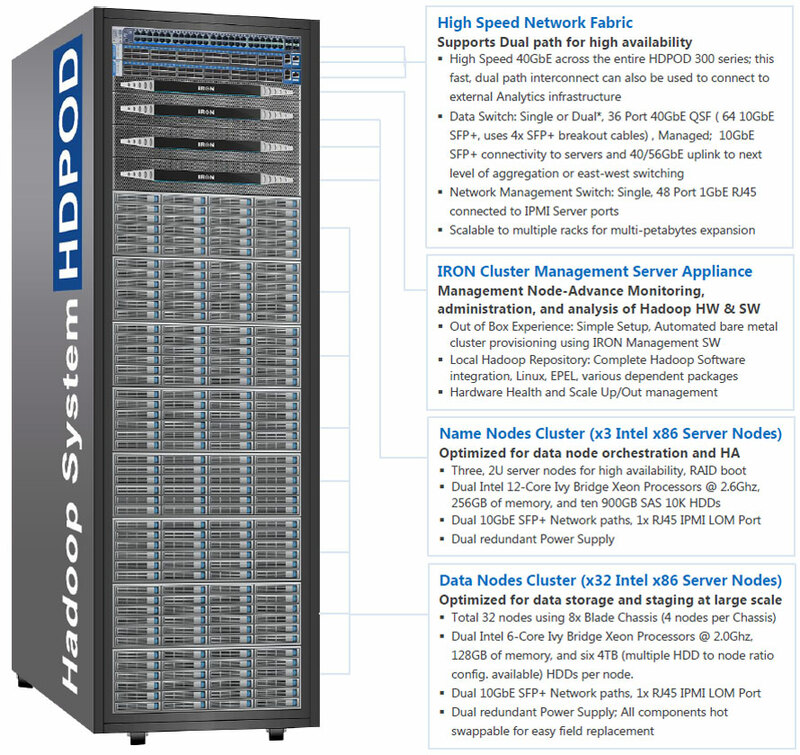 Iron Networks HDPOD Big Data Appliance is designed to be a Hortonworks Data Platform (HDP) powered Hadoop Proof-of-Concept (POC) platform for running enterprise data analytics environments. It is a complete Hadoop Big Data environment which helps validate big data for target business and boot straps project for a small price tag, sold as a single SKU. It is simple to install as a PC for a very small cost-> plug into the corporate network directly, power up and it is ready to use immediately. With ~100 (300 max) terabytes of storage, and 10 (2+8) nodes cluster, the HDPOD is powerful enough to be a full-fledged data analytics platform for any enterprise; customers can realize an ROI with the first few jobs. HDPOD can be used for testing, training, and later for production as-is or migrated to larger hardware platforms as desired. Rack-Level Resiliency: Resiliency is built into the design at multiple levels to deal with hardware and software failures; all components have N+1. The degree of resiliency is adaptable for mitigating power, network, storage and compute outages. Flexible Data Node Configurations: For Hadoop workloads, the storage to compute ratios vary from application to application; HDPOD offers multiple building block choices in 2U, 1U and half-U form factors, as well as Low Power consumption CPU options. High Return-on-Investment (ROI): Best-in-class standardized components to provide maximum performance leveraging synergies between components that are based on open standards, reliable and scalable, allowing organizations to save on cost and help grow with business needs.